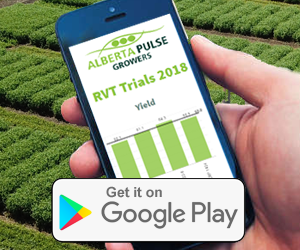 Welcome to Alberta Pulse Growers’ Regional Variety Trials (RVT) web tool. One of the pillars of best management practices for every crop is selecting a variety that is suited to your particular growing environment. 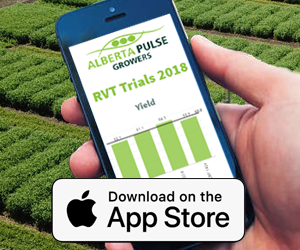 The Alberta Pulse Growers (APG) has funded regional variety trials across the province for many years to ensure that our growers have current yield, standability and disease resistance information relevant to their own farms. APG is committed to ensuring high quality data and sharing it in an easy-to-use way with the producers who need it. Only trials that meet industry standards for data quality are published. This web tool was designed to allow Alberta pulse producers to access the information they need when they need it. We hope that you find this tool useful and informative.